Welcome, we've joined with CardMaker Magzine for an awesome Blog Hop. Check out the list below to join in and see some fabulous designs using some of the newest dies and stamps from Suzanne Cannon from Quietfire Design. Make sure you leave a comment on every blog because there will be a $50 Quietfire Gift Certificate awarded randomly to one lucky commenter! All comments should be made by midnight PST on Sunday, September 24, 2017 and the lucky winner will be announced shortly afterwards! Good luck! I acquired a bunch of new stuff BIG GRIN especially some Penny Black stamps and while entering the images into my database, I also stamped them onto Arches 90# hot Press watercolor paper. I'm using the "Flower Lanterns" stamp on this card. Beautiful card!! Loving how you put it all together with the dies and the sentiment! And your coloring and design is great to make a beautiful card!!! Beautiful card, Yogi...as always! Love the colors!! Very pretty---love the easel card! Thanks for being a part of the hop! Beautifully done! Love the calligraphy with your wonderful floral art. this card is unforgettable Yogi! Thanks for the inspiration! Your easel card reminds me of Fall. Carmen G.
Very nice! The colors are awesome, and I love it! Such a wonderful card in so many ways! I love how you've combined the dies. Perfect! I love, love, love the flower lanterns as they remind me of my grandmother who had them. Very pretty card. Thank you for sharing. WOW! Just beautiful Yogi!!! Thanks so much for joining in the fun at our Double D ‘Sentiments & Quotes’ challenge! We hope you’ll come back often. Gorgeous watercolor effect! Love the front sentiment. Wow - this is gorgeous! Love it! A lovely card! Love the sentiments! Truly a beautiful card, Yogi. Love the stamp you chose and the colours are perfect. The Quietfire die is perfect! Really really nice. Love the Chinese Lanterns! Gorgeous card! What a cool easel card and wonderful combination of dies and stamps. them put on the base too. Very pretty card design and I like the sentiments. Exquisite card. The colors are so rich and lovely. Love the use of those dies! What a beautiful post filled with beautiful cards! This is so gorgeous!! I love that image of the Chinese lanterns; the vintage look is fabulous! Thanks for playing with The House That Stamps Built. Pretty, Yogi. You really are the Queen of Easel Cards! I love making easel cards so really appreciate the one that you created. The colors, designs and the saying result in a card that the recipient will keep for many years. Thank yo for inspiring me. Those are the most beautiful Chinese Lanterns! More new stuff? Yay! Sorry I'm so late to visit, but I've been very sick. Lots of catching up to do. Thanks for sharing with us at Double D, Yogi! 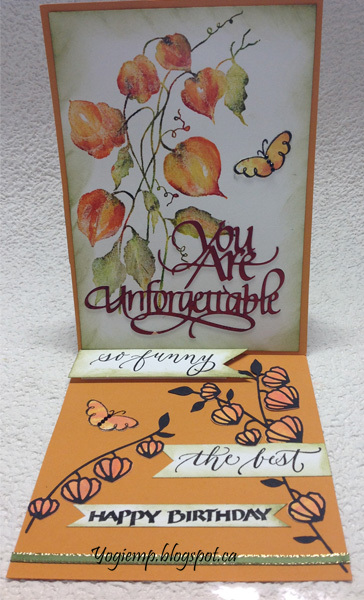 Beautiful fall colors and the Quietfire die cut lettering pairs so well with the Chinese lantern flowers. What a spectacular Fall card! 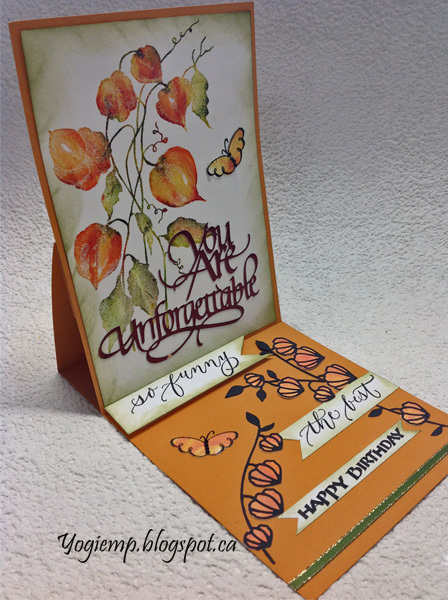 I adore your beautiful easel card with those gorgeous Chinese Lanterns! Your large sentiments are simply fabulous! Thanks so much for playing along with us at The Double D Challenge Blog, Sentiments/Quotes, Donna, DT Member. Yogi, this is such a gorgeous card! That stamped/colored image looks exactly like a watercolor. So many beautiful fall touches here. Thanks so much for sharing with us at the Frilly and Funkie "To Everything There Is a Season" challenge! Beautiful painted blossoms with gorgeous fall inspired colors! Lovely sentiments! Thanks for playing along with us at Frilly and Funkie in the "To Everything there is a season" Challenge!